At least 18 people have been killed in Argentina when a bus crashed into a lorry driving on the wrong side of the motorway. The crash happened as the bus approached the western city of Mendoza. Local reports say the truck, which had a Brazilian licence plate, was stolen and being driven at high speed. Footage recorded by a driver shows the lorry driving on the wrong carriageway of the Number 7 national road minutes before the collision. 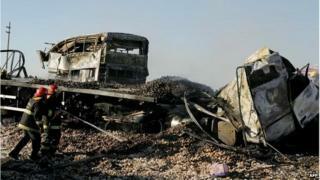 Most of the victims, including the bus driver, died as the bus and the lorry burst into flames on impact. Witnesses say some passengers made desperate attempts to escape the flames, jumping off the vehicle's windows. Thirty people were travelling on the bus, the authorities said. It had departed from the city of Cordoba, some 660km (410 miles) northeast of Mendoza.